Fully bunded all steel tanks designed to comply to all of the latest regulations. Completely free standing, simply connect up to a power supply and away you go! Our Premium range of all-steel construction tanks provide a tank within a tank (bund) the inner tank tank providing the required storage area, whilst the bund forms a watertight bund with a capacity of 110%. 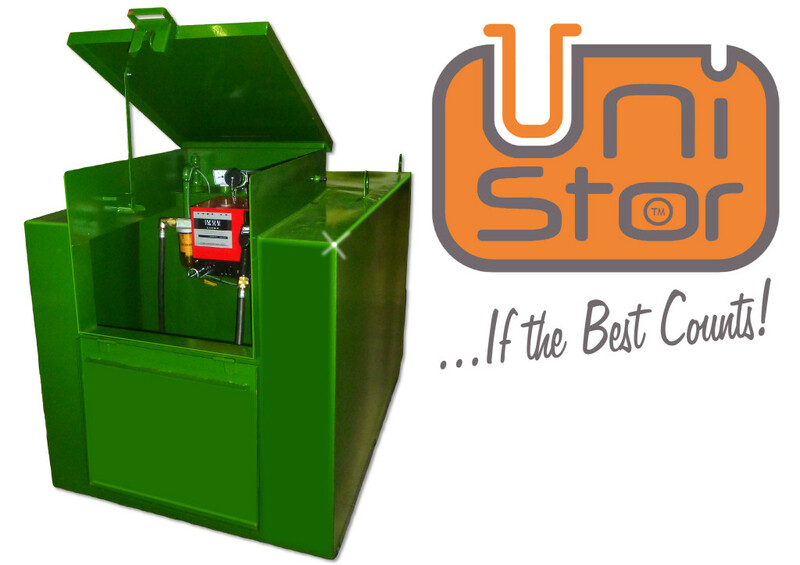 Suitable for the storage of bulk liquids such as Diesel, Heating oils, along with a variety of solvents and chemicals. Manufactured to the highest standards ensuring the units are extremely tough and robust; they are suitable for the harshest of environments in the most remote places. 50mm x 25mm channel on base of unit to allow air to circlulate. Self priming 56 litre/min 240 volt pump c/w 6 metres of hose, auto nozzle and flow meter fitted as standard. 72 L/min units available on request. Painted in Anthracite Grey as standard. Other colour options available. The above image is of the Piuse CUBE60 System. All our Premium Steel bunded fuel stations are supplied with the Piusi (Market Leader) Cube system which have been developed for the distribution of Diesel fuel . Complete with nozzle flow meter and hose set, these dispensers allow for fast, reliable and safe refuelling of vehicles. The flow meters within the system have a sturdy mechanical rotating read-out with a proven track record in reliability and easo use. 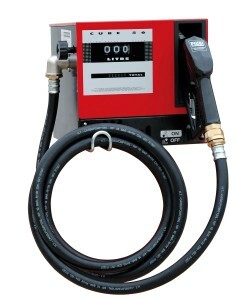 The standard pump unit supplied with these units will dispense 56 L/min. An upgrade to a 72 L/min pump is available. All our Steel bunded tanks feature a very generously sized Pump Compartment. Why? The first reason is that all our units are supplied with a 6 mtr dispensing hose and nozzle and having plenty of room to stow the hose away is an advantage. Also there is room at the bottom of the Pump compartment for small containers, grease guns etc. You will see a lot of steel bunded tanks with not only tiny cabinet doors and pump compartments, but also a lot access doors are placed very high up on the end of the tank. The reason for this is that the pump compartment is part of the bund and as you have to have a bund capacity of 110% of the tank storage the access door has to be at high level to achieve this. Our tanks have a completely seperate pump compartment. which means our systems are very accessible and easy to use. All equipment is housed within the pump compartment for maximum security. All suction pipework to pump is steel. Using steel makes it harder for anyone wanting to siphon Diesel out the tank. All our tanks feature a ‘Pyramid’ type roof structure. This is very important as Rainwater will drain away from the top of the tank. Some manufacturers tanks roofs are flat, and the weight of rainwater will eventually cause the tank roof to sag, which will result in rainwater collecting on the tank roof which will cause corrosion. Also our Tanks over 3500 litre have a Top inspection point and edequate ventilation. Heavy duty Steel runners are continuously welded onto the base of the tank for added stability. Heavy Duty Piusi Automatic shut-off nozzle with hose swivels to prevent hose tangles. 10 micron water and particle filter for Optimum fuel quality. Tank contents gauge supplied as standard. Hand built and tested in the UK. Haevy duty locks for maximum security. The nozzle can also be locked into the holster for added security. 5 Year Tank warranty. 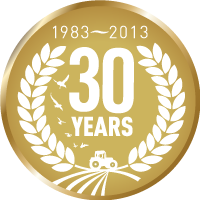 We expect our tanks to last at least 20 years. 240 volt pumps system fitted as standard. other voltages inculding 12 volt as option. Automatic On/Off switch. No manual switch to activate or deactivate. 1. You can upgrade your Pump system to a Cube 70 which will pump a generous 70L/min. This is the maximum flow rate we offer on our tanks as standard. NOTE: Higher flow rate pumps can cause a ‘frothing’ in your tank filler pipe which will keep cutting out the Automatic nozzle. 2. Hose Reels are available on larger units. They are self retractable and offer a 8 mtr 1″ hose set. 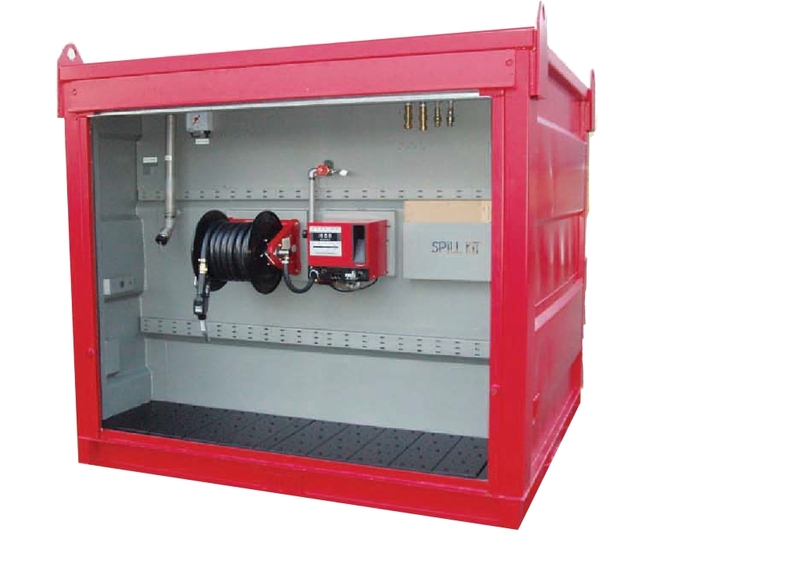 Most units would be housed within the pump compartment, but the image below shows an external Hose reel unit. Battery, hand or petrol pump. Full roller shutter door units. The totally enclosed bunded tanks offer a simple solution to the problems generally encountered with providing watertight bunded areas around tanks. The bunded tank of all steel construction, is a tank within a tank, the inner tank providing the storage area, whilst the outer tank forms a watertight bund with cappacity of 110% of the total liquid stored. All tanks are filled with a large lockable sumped cabinet which houses the tank’s fill point and outlets, with space for any accessories which may be required. 10’600 litres – 59’000 Litre capacities. Sizes; 10’600 ltr, 13800 ltr, 18000 ltr, 23000 ltr, 27000 ltr, 32000 ltr, 320000 ltr, 36000 ltr, 40000 ltr, 46000 ltr, 50000 ltr and 59000 ltrs. 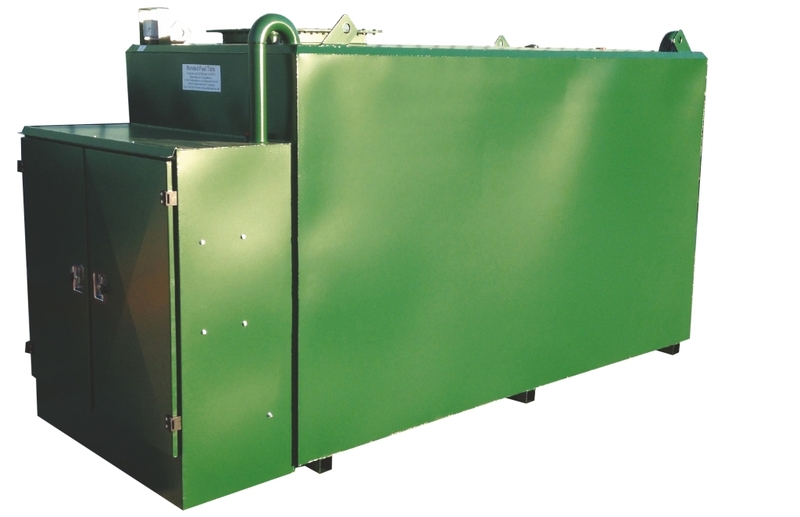 Containerised Diesel dispensers are manufactured with all steel construction ensuring the units are extremely tough and robust. They are suitable for the harshest of environments in the most remote places. They are built in various capacities and their unique design makes installation and transport effortless. The units are fully seam welded with a bulkhead fitting to form a bund area for the tank and a storage area for diesel dispensing system. each unit has also been designed to take a variety of pump options and can be fitted with a generator if required. 5’298 litre – 10’333 Litre capacities. 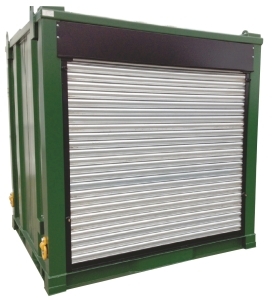 ISO Containerised Diesel dispensers are manufactured with all steel construction ensuring the units are extremely tough and robust. They are suitable for the harshest of environments in the most remote places. They are built in various capacities and their unique design makes installation and transport effortless. The units are fully seam welded with a bulkhead fitting to form a bund area for the tank and a storage area for diesel dispensing system. each unit has also been designed to take a variety of pump options and can be fitted with a generator if required. 23’226 litre – 50’127 Litre capacities. Double Acting semi-rotary hand pumps are used when there is no electrical power supply available. The K” unit is capablle of pumping upto 22 Litres per minute. Compact and reliable self-priming rotary vane pumps with built-in by-pass valve. Available in 3 different pumps sizes. Cube systems are simple and versatile. Both the pump and flow meter are housed safely in a steel cabinet for maximum protection. These units are available in 2 sizes %6 L/min and 72L/min pump options. The flow meters incorporated in the Cube pumps have sturdy mechanical rotating readout with a proven track record in reliability and ease of use. 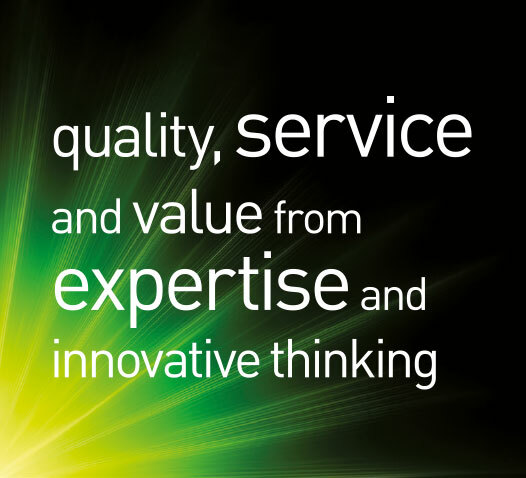 A range of user-friendly Fuel management systems to suit your requirements and budget,. Ideal for keeping a track on individual fuel consumption. Units avaialable for upto 100 users. For more information please contact our sales team. 10 micron Water & Particle filter systems are fitted as standard on our range of Diesel Dispensers. Tank contents gauge fitted as standard. Operated by a Float on a cord to display % of contents. We also offer Hydrostatic Tank gauges for greater accuracy of tank contents level. Electric Tank contents gaudes are avialable which provides a digital display showing tank contents in % , Actual volume left in Litres or actual fuel level in tank. Other functions included High and low level alarms etc.